The following is the introduction supplied by Revell of Germany on the front of the instruction booklet. The Phantom has earned itself a legendary reputation as the workhorse of the Western air forces. The two seat interceptor is one of the most versatile and powerful aircraft of the last 40years. The Phantom was used in 11 countries and achieved numerous world records. The F-4F version entered service with the German Air Force in 1974 which put 185 aircraft to use in the roles of interceptor and fighter bomber. The combat effectiveness for this version of the F-4F was later uprated with conversion to the Hughes APG-65 multi-purpose radar and the AIM-120 AMRAAM guided missile. WTD 61 (Technical and Airworthiness Centre) operates test rigs and a fleet of aircraft fitted with instruments and equipment for flight testing and data measurement from Manching Airfield near Ingolstadt. The job specification of the WTD 61 covers the entire spectrum of military aviation technology throughout all phases of development and operation of military flying equipment; these activities are aligned essentially on the overall system. Focus however is place on the integration of components, Sub-systems and mission equipment, including weapons to be used on the delivery platform. The interaction of various components and equipment in and on the platform within its environment both on land, sea and in the airspace is to be considered. WTD-61 undertakes these tasks during all phases of procurement, whereby in the field of aviation, especially during long phases in the use of airborne weapons systems, many tasks fall within the context of technical systems support. The large number of modifications to systems and their peripheral used by the Bundeswehr on operations place high demands on both the quality and quantity on the work done by WTD-61. With the introduction of the F-4F weapons system into the German Air force in 1974, the former test site E 61 in Manching initially received two of these aircraft for test flying to gather performance data and to expand the range of conventional armaments in the air to ground role. With the ramping up of the combat improved F-4F at the end of the 80’s , the F-4F with the tactical markings 38 13 was transferred from the then JaBoG 36at Rheine as prototype test bed to Manching. During a one and half year test phase in the US between the middle of 1991 and the end of 1992, the Improvised Combat Efficiency (ICE) program was successfully completed during which amongst other things, six AIM-120 AMRAAM missiles were fired. When the F-4F was retired from service, two of the initial test aircraft (37 15 and 38 13 were still successfully conducting flight testing operations with WTD-61. Between 1995 and 2005 the entire development ‘IRIS-T’, the modern successor to the ‘sidewinder’ including certification and series qualification was flown using these two test platforms. A unique measuring device, the measuring system sensor pod used to develop the surveillance head gave excellent service. From 2006, 38 13 regularly took part in Eloka (EW) trials with the German Navy during NATO exercises carrying foreign military ordnance. From 2008 it served as a high precision calibration of the EF 2000 fleet pitot-static system. The last flight of a German F-4F took place on the 30/07/2013 when 38 13 with 4801 flying hours under its belt took off from Manching sporting a very accomplished special livery with Lt Col Ritter and Lt Col Giesse as crew. The original design was created by Daniel Quinn in collaboration with Lt Col Ritter. The aircraft livery was applied at the German Air Force Maintenance Centre Erding. 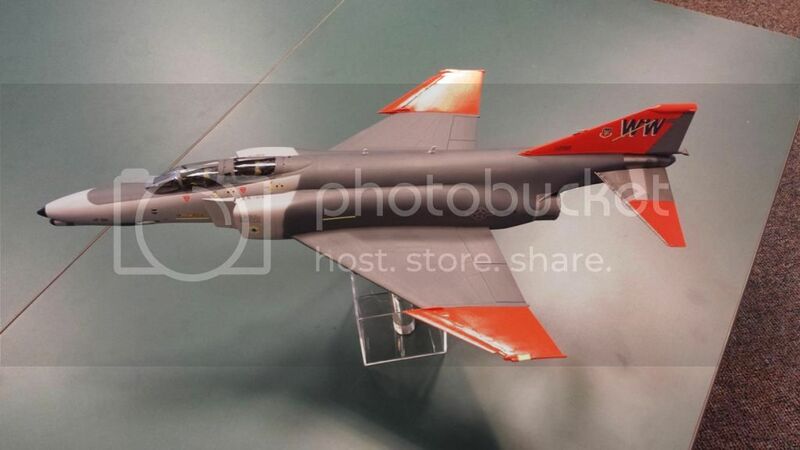 First things first, this is a re-release of the F-4F Phantom model in an all new finishing option, the model is marked with 1994 and so a 20 year old mould has been used. A look over the parts did not reveal any moulding faults that will affect the finished model. There are some flow/cooling lines present, but these again should have no effect on the look of the finished model as none of these flow/cooling lines has gaps that I could detect. I checked these lines using my thumbnail and detected no deformities. The cockpit in this model from Revell of Germany is pretty good detail wise. I have several books on the Phantom covering many of the variants and these books lead me to believe that Revell of Germany got a lot of the detail right. The front display console matches the images I have very well, that is not to say that it is perfect but it is close. I was only able to find one image of the rear console, and the detail here also matches very well and so I believe that Revell of Germany did a good job. The side consoles look fair but, it is difficult to judge accuracy as clean images of the side consoles are not as common as I would have believed; however the segments I have checked look acceptable. Revell of Germany has supplied raised detail plastic parts and console decals, the decals look quite good as does the raised detail. Decals placed over raised detail never looks quite right to the eye and so I suggest the raised detail is sanded off and the decals used, the decals are cut out and added individually or the raised detail is painted and no decals are used. The ejector seats are also fair to good details wise, and once painted should really look the part. As with all models there is a fair amount of detail missing from the cockpit, in particular the walls behind the ejector seats are void of detail. For those modellers who want to really add the bling to this model a resin cockpit will lift the look of the finished model in an area everyone looks at. While on the subject of replacement cockpits I have seen reviews of previous renditions of this model and some state that the rear tub is too low, I am not in a position to comment on that information, but if it is wrong then a resin replacement should address that issue as well. For Joe average I do feel that this area of the model from the box will be acceptable. In this area I will also cover the underwing airbrakes that are supplied as separate parts in this kit from Revell of Germany. The airbrakes look to me to be accurate in all respects when it comes to shape and location and that also includes the detail on the inner faces, there is a couple of panel details missing from the outer face of the airbrake, these however can easily be added by the modeller. While in this area I will cover the wing wheel bays. Revell of Germany has replicated some detail inside these wheel bays, but as with every wheel bay I have looked at model wise more pipe and wiring detail needs to be added in order to improve accuracy. The wheel struts also look very good detail and accuracy wise; again some cabling will be required if wished in order to further improve the look. The only downside I can see here is that Revell of Germany has split the main legs in two halves, and this will make hiding the joints and the clean up afterwards a pain. Moving onto the wheels the good news continues, the wheel face you can see matches the detail seen on German Phantoms, but I cannot vouch for the hidden face. A real plus for a Revell of Germany model is that they have supplied the option of weighted or un-weighted tyres. Moving onto the nose wheel; the wheel bay itself does have some detail present, but you will not be surprised to hear that it will benefit from some scratch work to lift the detail to a higher standard. The nose wheel strut is where this area falls down, checking through my reference the J version of the Phantom has a bulky strut at the front and Revell of Germany has not provided that here. Going from pictures only the front strut looks a closer match for an S version Phantom, as such the modeller will either have to beef up the strut, seek out a replacement strut or scratch build a strut. I can hear it now “What do you mean it’s not accurate” Well before you start shouting too loudly consider the price of £36.99, another Phantom in this scale from another company will cost you at least 4 times that price. Finishing on a high in this area, the wheels. The wheel pattern does look to match my reference and you again get the option of weighted or un-weighted tyres. Revell of Germany has supplied a radar assembly for this model as an optional extra. My opinion of the radar assembly is not overly positive, the radar emitter seems to be the only part I can say looks accurate when compared to my reference, but in fairness I suspect that back in 1994 access to this element of the Phantom may have been restricted and so Revell of Germany used best guess. If you do decide to use the radar then some surgery will be required on the front of the model, I myself would prefer to use this area as somewhere to add some weight and ensure that the model does not become a tail sitter. I should say that there is no indication that the front needs to be weighted, but it will be too late to add weight after the model is assembled. The air intakes are quite well replicated and allow an easy view of the compressor detail present inside the fuselage of the model. The downside of this is that the tubing that feeds the air from the scoops to the engines is not supplied. The jet exhausts have very nice detail that looks to me to be accurate, the detail on the walls of the exhaust inside the aircraft is very nice; however this detail does seem to be a little short on length; my reference shows 4 disticnt rings in the nozzle and the kit has 3. The nozzle of the exhaust has good detail inside and out and that detail should look quite good if you use a paint that can be polished and so leaving dark areas in the shallow detail. The fuselage of the model has some very nice and subtle recessed panel lines. A check against my reference indicates that the lines are accurately placed; I will say that I did not check every line and I did locate a few that were missing. There is not really a lot to add as regards the fuselage other than I hope you have a big space for this puppy to live. The wings have a good profile and there are no obvious structural omissions, I will say that I would have like to see more of the control surfaces supplied as separate parts, but you have to consider the price. Revell of Germany has done an especially good job on the wing fence shape and the leading edge wing tip which matches my reference especially well. There are only two concerns I have about the wings and that is how well and easy it will be to get the correct angle on the wing tip; and on the underside I believe the slots for the rear AIM missiles is too far back and should be further forward so that the missile fins sit in the cut out where the airbrake goes. The horizontal stabilizers are attached via a slot in the fuselage and this will provide a very positive connection; however again make sure to get the angle right, Revell of Germany inform you that it is at an angle of 23 degrees. Most other kits I have tackled of the Phantom have used a pin or even a swivel pin to allow movement and I have always found that method made getting the angle right difficult and the connection weak. The canopy is fairly thin and does not distort what you see by much. The canopy can be displayed open or closed and will look good, I believe. There is of course room for improvement via the addition of the rear view mirrors that are absent in the model. Also included but not mentioned for use is an alternate centre line fuel drop tank and a pod that I cannot identify. I do have a concern about the AIM 120 AMRAAM missiles; my concern is that the forward fins may need to be moved forward of the position they are from the box, this is because the slot it fits in appears to be correct as does the rear fins, the front fins do not lay where I believe they should. The instruction booklet is loose leafed and uses black and white line drawings to guide you through construction. I did not notice any obvious errors in the instruction booklet, and other than it not stating if any weight needs to be added to the nose. I like the fact that painting instructions are called out during construction, but I would have liked to see the ordnance painting instructions called out also. The decals are fair due to being reasonably thin, but the size of some of the decals may end up with the need to fill the bath to wet them before adding to the model. The large size may also make adding some of these decals to the model difficult, but it should look impressive and eye catching. The model has its faults but there are also a number of positives, not least of which is a great price for such a large model. If built straight from the box you will get a reasonably accurate model that will also be eye catching in the finishing option supplied, and I have no doubt that this will be a popular seller for Revell of Germany. Highs: I feel the thing that struck me with this model is the inclusion of weighted wheels and the very good price make this kit a winner with me. Lows: The nose wheel strut will be difficult to correct. Verdict: For £37 you cannot really go wrong with this one. I think the unidentified pod mentioned is a LANTRIN. Mike: Regarding the front strut I could only go by images I had and it looked a lot closer to a S model. As regards the other faults listed, I am aware of these comments on various sites, but most seem to just repeat what has been said rather than verify the findings. I was not able to verify them and as such I did not want to make comments I could not prove. Joel: the checkerboard decals will I believe take a lot of care to get right, but the effort I think will be worth it. Thank you all for your feedback. I do think this model is excellent value for money and will satisfy quite a few people straight from the box. I am aware of listed faults and perhaps should have included them, but looking at the parts on the sprue I was unable to visually varify them, for that I am sorry. i will take a look at the various resin corrections and upgrades you offer as my daughter when she was four broke the raspberry ripple Phantom at Boscombedown, She was sat in it while I did some fibre glass work on a BAC 111 cockpit and set off the hydraulic piston for when the system has been compromised. I was looking for a hole in the roof thinking the ejector seat had gone off.